It's a fact of life that kids grow up all too soon. Your baby is now a toddler, and the charming nursery you created in your Springs luxury apartment home no longer serves its purpose. The good news? 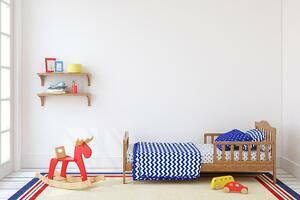 Transitioning to a toddler's room doesn't have to be a major project. Here are some great tips for updating with a minimum of time and money. The biggest clue that it's time to change comes when your toddler keeps climbing out of the crib. If you have a convertible crib, it's a simple process. Toddler beds with built-in guard rails are available in a number of styles, or you could simply purchase a bed rail and attach it to an existing bed. Now that your toddler is free from the restraints of a crib, the floor becomes one big play area. Remove any furniture that has outgrown its usefulness, such as bouncy seats or swings. If there’s a rocking or easy chair for late-night nursing sessions, consider moving it to the living room or your bedroom. Kids love the feel of soft textures that offer safety and comfort. Give them plenty of cushioning with area rugs, throw pillows and other plush fabrics. The downside of a child who's become mobile is that they consider everything within their reach to be fair game. Get down on all fours and use a kid's-eye view to find and remove items that are breakable, choking hazards or present any type of safety risk. While you're there, this is also a good time to childproof all electrical outlets. A new decor doesn't have to be a total do-over. Incorporate items such as framed photos that are less age-specific, and use these DIY ideas to add color and variety. It's even better if you and your toddler can work on them together! Create a "gallery" of your child's own artwork. Give your toddler a head start on reading and spelling skills with block letters on the wall. Spell out names and special words or just use the whole alphabet. Washi tape comes in an infinite number of colors and patterns. Better yet, it can be removed from a wall with no residue left behind, making it perfect for murals that can be changed when the mood strikes. Peel-and-stick decals are another option for colorful, non-permanent designs. Whether you're blissfully single or have a growing family, our Springs luxury apartment homes have floor plans to accommodate both. Stop in and chat with a friendly member of our on-site management team.